October means orange leaves, greying skies, digging out your fluffiest socks, and apples. Lots and lots of apples. We'll be rustling up apple pies and crumbles, drinking cider (lots of cider) and dolloping apple sauce onto autumnal pork dishes. So what wines will match? 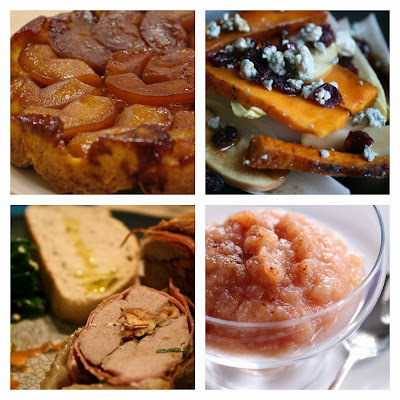 The tart, sweet glazed apple accompaniments to fatty, salty pork are always a hit in my household. It's a whole lot of flavours mixed together, which sounds tricky when picking a wine, but it's actually easier than you think. German and Alsace Rieslings are often packed with appley flavours themselves, and they can also match the apples in terms of acidity and sweetness. 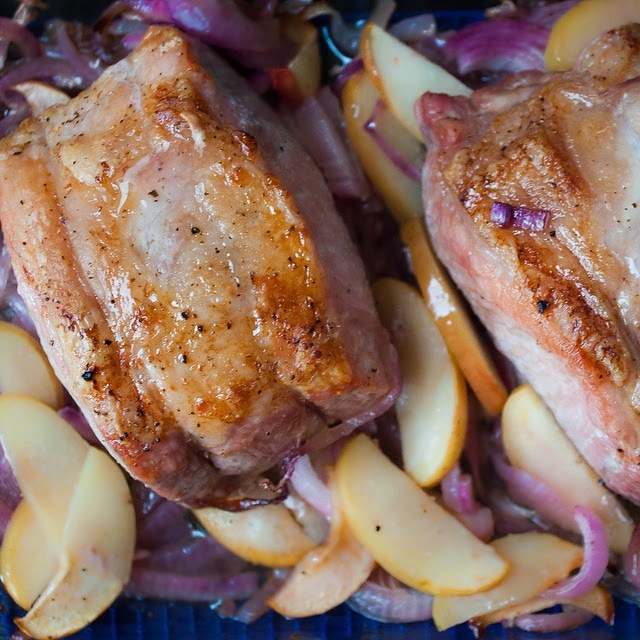 This type of wine will cut through the fatty pork in the same way the apples do, and brings the whole dish together in a delicious balance. Tesco Finest Mosel Riesling is a perfect example of this - off-dry, it is crying out for pork. It's also on offer at the moment - a bottle is currently £5.99 down from £7.49. If you prefer it just a tad less sweet, and from Alsace, then Trimbach Riesling is the way to go. It may be £11.99 (at Majestic) but it's so, so worth it to get a benchmark Alsace Riesling. Apples work brilliantly with autumnal veg like chicory, plus walnuts and blue cheese. A perfect autumn salad isn't complete without some chopped, ripe apples. There's a whole lot of flavours going on here, so it's practically impossible to get a classic match. I'd maybe plump for a Vouvray Demi-Sec like this one from Waitrose for £11.99. It's got a rich, appley, peachy character that's just as nice drunk on its own as with food, but it should suit the apples and blue cheese well. Another option is a rosé - although going 'out of season' now (apparently, no one drinks rosé past August) it's actually perfect for autumnal dishes like this. Southern French rosés are best - Sainsbury's Languedoc Rosé is actually surprisingly flavoursome, and only £6.99 a bottle. These desserts are some of the most popular ever, and are just heaven at this time of year. You can take one of two tacks with this one: some prefer a lusciously sweet dessert wine that matches the sticky sweetness of the dessert, but others would rather serve these desserts with just a light, slightly-sweet sparkling moscato so the dessert can do the talking. Another Moscato that would be perfect for lighter apple desserts like apple pie (or even a fruit salad) is the Moscato d'Asti from Perrone from The Wine Society at £7.50. It's 5% alcohol, with just the right level of sweetness to match the acidity. Perfect. Most people would opt for Sauternes, but there are much cheaper alternatives from other regions and countries. Tesco Finest Dessert Semillon (£6.79 per half) is from Australia, and packs all the delicious, marmaladey, honeyed flavours you need at half the price of most Sauternes. Lastly, back to Vouvray: Majestic sell Vouvray Moelleux La Levriere - the more luscious dessert variety of the drier example I chatted about earlier. It's currently £12.99 or £9.99 if you buy two bottles, and is so rich and smooth it is practically made for caramel, but it's still light enough to be apple's best buddy. What apple delights are you rustling up this month? Let us know in the comments. Images in collage taken from Stephan Surf, Jameel Winter, notahipster, and thebittenword's photostreams and under the Creative Commons License.